Keep your fishing equipment happy, happy, happy! Fishing equipment will last a long time with proper care and maintenance. Gears need care. Simple as that. Proper lubrication improves the function and extends the life of reels. Had a reel for a year or two and it’s just not the same? Give it some love! Right now, with winter setting in, is a good time to think about maintenance. Even if you’re a 52-week angler or a full-time fishing guide and never stow your gear for the season, your gear still needs maintenance. Weather surely will knock out a fishing day sometime soon. Invest that day in tackle maintenance and commit to establishing good care routines. In the long run, you’ll save fishing time, lessen the likeliness of lost fish and make the gear you have invested in last much longer. Reels, which are delicate and somewhat complex, offer a good place to start. They should be wiped down and dried after every use and occasionally opened for basic lubrication and to check for any debris that might have gotten inside the reel. Reel maintenance needs to be ongoing, not just a season-end thing. Reel parts see a lot of use and need to be taken care of on a regular basis. If you opt to do a total breakdown for cleaning and lubrication, keep the exploded parts view from the manual in front you. Modern reels, especially baitcasters, have far more parts than most anglers would expect. Laying down a piece of heavy white paper to place all the parts on will help you keep them organized and help during reassembly. Lubrication should be according to manufacturer recommendations. I prefer Quantum Hot Sauce Reel Oil for bearings and small moving parts. I use a small cap, like from a water bottle, fill with oil, and let the bearings soak for a few minutes. Quantum Hot Sauce Reel Grease, for example, is excellent for lubricating a reels gears or pawl, but it’s not designed for something that needs to spin freely, such as the spool shaft or bearing on a baitcasting reel. Those require light oil, and a heavy lube or grease will slow the spool and shorten casts. In general, for parts that mesh, such as gears, use reel grease. For parts that rub, use oil. Grease differs from oil based on thickening agents that help it stay in place on gears. A small stiff brush is useful for getting lube down into the gears of a reel. Q-tips work for cleaning in tight corners and old t-shirts are great for wiping down parts. 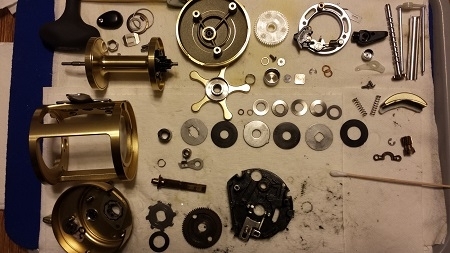 If you have a small parts cleaner, load it with alcohol and your reel parts, and all your parts will look practically brand new! Remington Rem Oil, in a spray can, is also great for cleaning and lubing small parts all at once. When you clean your reels, be sure to check the line. If you’ll be stowing your rods and reels for a couple of months, strip the line and leave it off until just prior to your first trip of the new season. That way you’ll know you are starting with fresh line when you begin fishing again. If you’re just taking a maintenance day and will be fishing again soon, strip the line and re-spool. Line lasts a long time on the original spool as long as it is stored in a relatively cool place and out of direct sunlight. The lifespan of line on your reels is much shorter as it wets and dries, sits out in the heat or gets twisted and nicked with use. The amount of line on the spool also gets smaller as you change lures and lose baits to snags. Unless your line has been very freshly spooled, there’s no reason to not start fresh as long as you’re working on your fishing gear anyway. Rods are much simpler than reels and don’t require much maintenance. Rubbing a fishing rod from end to end with a damp cloth and then a dry cloth does help keep a rod in good condition, but the most important bit of rod care is a simple check-up. Look at every rod from end to end to make sure reel seats and handles remain secure and that all the eyes are straight and have inserts that are fully intact. A tiny chip in an eye insert can fray your line, and you may not know what happened until it is too late. Looking past the rods and reels to lures and terminal tackle, the first important step is a good organization session. Whether all your gear is in a single tackle box that you carry everywhere or your boat or closet serves as a giant tackle box filled with smaller stowable boxes, everything should have a place. Even if you are extremely organized, things tend to fall out of order as you fish, and occasionally you need to stop and resort. Beyond the obvious on-the-water value of quickly finding a certain color of fluke or topwater lure when the fish suddenly start schooling, putting things back in their places reminds you of items that have run low, hooks that have gotten bent out of shape and need replacing and other upkeep tasks that need to be done. Make a list of things you want to replenish and visit the tackle store or place those orders right away so you don’t suddenly remember that you had run out of jig heads as you’re about to tie on a sassy shad swim bait. This is also a good time to re-evaluate your lure sorting system. If you’ve gotten more into jerk bait fishing more than you had in the past, for example, those baits might be overflowing and it might be time to start a dedicated jerk bait box. If you do use some sort of stowable-box system, sorting baits and terminal tackle by category and putting easy-to-read labels on the edges makes you much more efficient on the water. Labels don’t have to be fancy. A roll of masking tape and a permanent marker do the job just fine. Or if you have a buddy with a label maker, take him fishing and make him bring it along! By the time all your baits are back in their place, you should have a pretty good feel for what else needs to be done to get everything in good working order. Beyond replenishing supplies, the biggest job that might need to be done is hook sharpening. If you have boxes filled with lures, testing hooks for sharpness and honing them with a sharpening tool can seem somewhat tedious; however, it’s a far better option than setting the hook on a big fish and coming up empty. Big fish have big bones and tough skin, don’t skimp with dull hooks! While you’re in the sharpening mode, it’s a good idea to pull out a stone and sharpen your filet knife, lubricate your pliers or multi-tool and make sure other accessories are in good working order. Finally, once all the tackle is in good working order, take a peek outdoor and see if the weather has improved. Hop in the truck, take the boat to the lake, and enjoy the satisfaction of all your clean and great working fishing gear. And remember, hook sets are free; rip those lips!